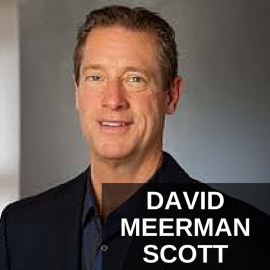 Jason Hartman welcomes back marketing strategist, public speaker and author David Meerman Scott to the Speaking of Wealth Show. Today’s episode has David talking about his new book Marketing the Moon, gives some detail examples of people who made great use of newsjacking, and his belief in the importance of telling stories with conflict for public speaking. 1:25 – David talks about his reasons of why he wrote Marketing the Moon. 3:58 – David explains newsjacking by talking what Trent Silver did with his CashForPurses. 6:59 – David talks about how Joe Payne made a nine million blog post by newsjacking. 11:02 – David explains the importance about having relevant news to tie in your business. 15:14 – The most important tip about public speaking is telling stories to your audience. 18:09 – Conflict is essential for a captivating story telling without it people won’t bother listening. 21:28 – David try to help people with their internal fear and conflict of social media by using stories. 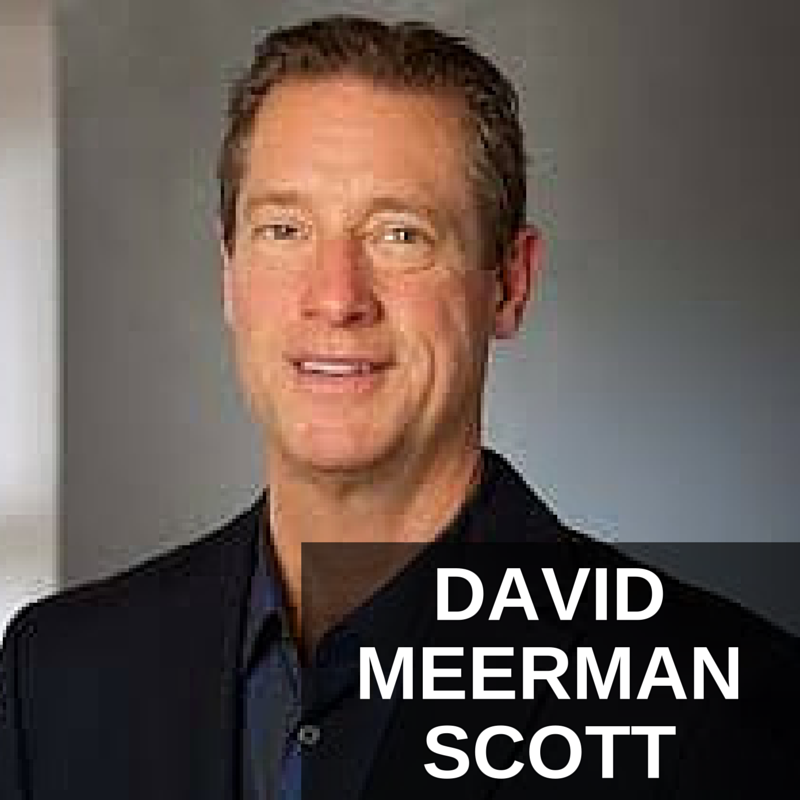 It’s my pleasure to welcome David Meerman Scott back to the show. He is a very dynamic guy, author of ten books, two release last year, he is an expert on public speaking, sales, marketing and just growing your business. Of general interest would be one of his books last year which was about how they marketed the Apollo space program and that’s pretty fascinating stuff. So, let’s welcome him back, David, how are you doing? I’m doing great, Jason. Thanks for having me back on. Yeah, it’s good to have ya. So, just quickly tell us about Marketing the Moon, when I was a kid I loved the space program, I followed everything, you know. Oh, me too. I mean, I was such a space geek as a kid and I was eight years old for Apollo 11 in 1969 and as a young kid I remember they would roll the black and white televisions into our elementary classrooms, so we could see the launches, which was great, and I kind of lost track of it then after Apollo 17 in 1972 and, you know, one day about fifteen years ago I was in Barnes & Noble I picked up a book about the Apollo program and my interest was rekindle. So, I actually started to collect artifacts from the Apollo lunar program I have probably one of the largest collection of space flowed material from the Apollo program, I have check lists that went to the surface of the Moon, I own the control handle that was used for Apollo 12, and then this got me to events where I met a bunch of the astronauts, they’ve actually had significant conversations I go over meals or drinks with more than half of the guys who walked on the surface of the Moon, and then I realized that it wasn’t just the Apollo program itself that was amazing. I mean, imagine getting twelve people to surface of the Moon using 1960s technology, but also the fact we actually did it that we committed our budget to it, I mean that could never happen now. So, I put on my space geek hat, I put on my marketing hat and I wrote this book called Marketing the Moon and looked at all of the really interesting things that went on to market the space program, so that we American citizens were eager spend 2% of our national budget and 4% of our workforce over the course of a decade to do this crazy audacious program is a really interesting set of things I learned. I mean, for example, the Apollo Lunar program was really the start of live color television using remote cameras, you know, they transmitted live color TV from the surface of the Moon that had never been done before, television had always, television always been hard wired to a studio and Apollo was responsible for that. So, there’s a whole bunch of really cool things that came out of it. Absolutely, newsjacking is the art and science of injecting your ideas into a breaking new story. So, the basic concept is that there always new breaking constantly and especially in our web driven world all you do is go to Google News, which is news.google.com that’s my go to source to find out what the most important stories are and then any story that comes up that has interest to you that you have some kind of expertise around, you can then create a blog, do a YouTube video or in some other way create a piece of content that puts your take on that new into the market place and as a result of that people then learn about you and sometimes it just is becomes wildly successful. So, for example, Trent Silver is a…. He’s been on the show, yeah. Has he been on this show, yeah, and he is a fantastic newsjacker and Trent– what Trent got a number of businesses, but one of them is called CashForPurses and what he does is he purchases used handbags, high-end ones Louis Vuitton, Prada, things like that from people and then sells them on other– makes money on the transaction. So, Trent became a newsjacker and has done a number of things, but one of my favorite ones is that he found out that Lindsay Lohan was having money trouble and he just found out about that from monitoring the news and she was in the news because she wasn’t paying her bills and what not. So, what he did he created content on the web offering to buy her purses from her and that would help solve her money problems, hysterical, and what was great was the media picked up on that. So, he ended up being in The Inquisitr and The Huffingt Post, Essence Magazine, he was on Katie Couric television show. I mean, just got tons and tons of publicity and every time one of those media outlets talked about Lindsay Lohan can solve her money problems by selling the purses they all mention CashForPurses, Trent’s business. He got 8.000 inquiries from that ended up buying a quarter of a million dollars worth of handbags just as a result of that and the marketing cost for doing that was zero and he made a ton of money by on selling those handbags. So, that’s the idea, the idea is to find out what’s going on in the news and then when something is related to your business creating content around it to get notice. Okay, so that is awesome idea and, you know, as I look at the news today, you know, can we just do a couple more examples if you have on this, because everybody could benefit from this, this is big folks, you know, it’s not that hard. So, certainly there’s the method of distributing this commentary on the news and so forth and why would anyone care, you know, what I think or what anybody listening thinks about the news if they’re not already famous, right? No, not necessary. I mean, I think it really depends, you know, if you run a local business then you probably want to focus on local news, if you run a B2B business you probably want to think about the news that’s happening in your industry, if you run a global or national business like, for example, Trent Sliver did, you want to focus on global national news. I’ll give you an example in the B2B world there’s a company called Eloqua and the CEO of Eloqua, there’s a marketing automation software company in a real niche B2B business and the CEO of the company learned from one of his contacts that his biggest competitor was going be acquired by Oracle, by this giant software company. So, for most people that information means nothing, I mean giant software company making acquisition, but for that market place it’s big news and the media, the niche media needs to know about, the analysts need know about customers and employees everybody, you know, wants to know about this. So, Joe Payne is his name was the CEO of Eloqua was in a unique position to provide commentary on what this acquisition means, because he is the CEO of the competitor to the company that was acquired. So, what he did was and this is the hallmark of newsjacking it has to be quick, tomorrow is too slow, it’s got right now, you got to just bang it out within an hour or less, because you want to be the first person as the news cycle is breaking. So, what he was he wrote a blog post talking about what this acquisition means to the marketing automation software business and the blog post was called Oracle Joins the Party and it had data in there about the marketing automation software business, it had some great quotes from him about what this means and he essentially did the analysis of, he was the first person to do the analysis of what this acquisition means and then when a couple of hours later the journalists was writing their stories about the acquisition they all quoted him. So, he was quoted in Business Week, and PC World, and Information World and all the important business-to-business publications that cover this news, and then they did something very clever they then went to his blog post in an email to all of the existing potential clients that they knew might be interested in knowing about this acquisition and as a result of doing that they generating a million dollars with a new business. A million dollars worth of new business form one blog post, because the people who chose to go with Eloqua decided they didn’t want to be a part of Oracle, they didn’t want to go with the company that was making acquisition, it was a huge thing for them and then there’s an interesting punchline to this story a couple of months later Oracle also fought Eloqua and it was an eight hundreds and ten million dollars deal and based on the amount of revenue that Eloqua had that one million dollars worth of new business in the blog post ended up being nine million dollars extra in the valuation. So, there’s my proof that one blog post if note newsjack extremely cleverly can be worth as much as nine millions on to your bottom line, so that’s pretty cool. So, so, so it’s works for B2C, it’s works for B2B, you know, anybody who wants to get their ideas into the media stream. So, I like the website Newer a lot, because it just, you know, I like it because their motto is read less, know more, you know, and every article is pretty much the two paragraph and if you want deeper there’s always a link, so you can get in deep, you know, but you got Britney Spears, X was killed by the Taliban, you got a surgeon shot at a Boston hospital, this is all bad news, okay, sorry listeners I’m just reading, okay, woman lives on a cruise ship for a hundred and sixty-four thousands dollars a year, you know, Dow erases early losses, takes up three. I see a bunch of those. So, yeah, so now the idea is you think, okay, what is my business and how can I tie one my stories, my ideas to one of these stories, so it does not work to just randomly tie one of your stories, your ideas…. It does have to have some context, yeah. It does have to have some context and that’s especially true, I can’t emphasize this enough with bad news, you should never try to newsjack bad news unless you have a very, very solid tie to it. Now, let me give you an example of that, so there was the Hurricane Sandy that came through a couple of years ago devastating to New Jersey hundred of people lost their lives, power was out for millions, there was a billions worth of damage to homes and business and during that American Apparel newsjack and what they did was they said…..
Good old Ryan Holiday, he was on the show. Was he? And they said, and they said if you were affected by Hurricane Sandy then you get 20% and people thought that was really crude. It should probably be free, you know. Well, you don’t just, gosh, try to sell handsome shirts on the backs of people misery at the same time the battery manufacturer Duracell, what they did was very clever, they have an automatic motorized vehicle that you charge a mobile phones with. So, what they did was on Facebook they announce that they were going to have these motorized charging stations be available in hardest hit areas and they didn’t do it for the publicity, they did it because they wanted to help people and they offered free, a free way to charge your computers and your smart phones and so you could just go to the thing and charge up your iPhone or your Android or whatever you have and all for free and then people love that and they got some good publicity for it. Okay, so I’m looking at Justin Bieber here on…. Yep, there you go, there’s one. Right, I love this example there’s Norton Security, right, they do virus software, about a year ago Justin Bieber had a new single that came out, so what they did, I love this, they did, they created an image and put it out on their blog, I believe, and also their Twitter and their Instagram and it said, “Warning! There’s new Justin Bieber single out, if anyone tells you to download that, don’t do it, it’s a Justin Bieber single.” And it’s hysterical, because they made it look like there’s this virus, but they were actually poking fun at Justin Bieber by saying don’t download it cause it really is a Justin Bieber single and it ended up creating a spike of interest in Norton Security and they actually had an 18% increase in their sales over that particular week. So, it’s just tie your ideas to what’s going in the news. Yeah, very good point and I think that’s just particularly important, because you get to write off the coattails of the existing news, you know, you don’t have to create something you just write off of the momentum that’s already there, right, that’s the key, right? Or maybe you’re just like an environmental activist, it doesn’t have to be that specific, you know, not necessarily. Yeah, environmental activist or I’m a fan of nuclear power. I mean, whatever it is I can create a piece of content around that. Let’s talk for a moment about public speaking, you know, everybody has to give a presentation from time to time, some people do it all the time as a business. What tips would you share with people, David, about being more effective from the platform? Great, great question, thank you for asking that cause I’m a student of public speaking I have, I’ve delivered probably about six-hundred presentations now, I do about forty or so a year and have been for a number of years paid speeches all round the world. The real important thing that so many people don’t do, I say about 90% of people don’t to is tell stories, almost everybody when they’re delivering a speech they deliver information, because that’s what they believe they’re supposed to do, you know, they have convoluted power points slides with data on them and, you know, they believe their job is to deliver information, you’re job is to deliver information, but it has to be interesting. So, the most important thing in my mind is that you need to tell stories because we humans react to stories, we don’t react so well with data, we react very well with stories. So, the simplest thing that you can do to spice up your presentation and get people interest is don’t deliver just information for the sake of information, deliver a story about the information. So, for example, when you asked me about newsjacking I could have told you how to do newsjacking, but instead I told a story about Trent Sliver and I told a story about Joe Payne and Eloqua and that in my mind is a better way to deliver information and the way I see people react when a speaker is telling a story, you know, they get generally interest, they physical sit up in their seat to pay more attention. But I don’t think I’m a good story teller at all, I don’t tell many stories, I think it’s my big weakness, you know? Listen I downloaded, you know, audio books on the great courses from Audible about story telling I still think it’s my weakness after all these years I’ve done a zillion speeches and people tell me I’m good, but I think the story telling I’m really missing, I think I’m really missing out on that. Not too interesting, it’s more– you got to be the hero journey, right? You got to do the Joseph Campbell thing, yeah. Right, so you’ve got the other story which is two people meet each other, they fall in love and then there’s some action that causes them to break apart and then they’re in conflict with one another for some period of time and then somehow they get back together and then they get married, and there’s hundreds of movies and thousands of books that are on that particular story line, it’s the conflict that’s interesting, it’s oh, they used to loved one another, now there’s some issue between and, you know, let’s get them all back together again. So, that idea of conflict becomes a really interesting book for stories that you can tell in your speeches, but also there great for blog posts, there great for almost any kind of deliver of information and especially with something, you know, complex B2B product, whatever it might be, a complex consumer product, the idea of conflict— I had a writing teacher tell me once that writing without conflict is propaganda. It’s a corporate puff piece, yeah. And it’s boring, but if you say, “This company had a really important issue that we needed to solve. We decided we wanted to help them, but then the bosses didn’t want us to put the product in because they say, they didn’t need it and they didn’t want to spend the money.” Okay, now you’ve set up the conflict, one person wants it, the other person doesn’t and then you build the story around how you had to convince the bosses that this is the right thing to do and it’s was hard slog to do that convincing and then you finally convince them and then everybody is going to live happily ever after cause their bosses are so thrill that this product is doing it’s job. The power of stories is amazing and I think when you talk about the importance of adding conflict to your story, maybe, you know, a psychologist could probably figure this out, I certainly can’t, but you know, I just want to think, David, that it has something to do with the fact we all, if we don’t have conflict in our outer lives then we have it going on in our mind, you know, and by hearing a story that includes that conflict it helps people believe it and work through it and sort of see the rand vision of the story, I don’t know why it’s just more rememberable and impactful. I totally agree with you, you know. I think that’s absolutely right and I think you’re absolutely astute in saying that the conflict can be inter, because many times and this is absolutely true with films, films and books that it can be internal conflict, it can be one person in conflict with themselves. You know, one of the thing I do when I give presentation is try to help people through their internal conflict around creating content on the web, and doing social media, and being on Twitter and things like that and a lot of people are fearful of doing that. So, I used a story in a presentation, I did a couple of days ago about the two guys who just climb the Dawn Wall of El Capitan, they completed their expedition last week and it was nineteen day expedition, many climber consider the most difficult climb in the world, they did a free climb up this essentially rock wall in the Yosemite National Park, but what I found was incredible cool was that they actually carried their mobile phones with them and they have solar power charging devices, so that while they’re hanging on these rock walls, they could actually be tweeting on Facebook and I even heard an interview that they did on NBR while they were on the rock wall. So, I said to the people in my presentation like, “My gosh, if these people can overcome their fear of real time communications and they’re on a wall like that.” And I had a picture from one of the newspapers on the wall, you know, “What’s the problem with your internal conflict around not being able to do this, because you’re fearful of it.” So, you know, there’s lot of different ways that you can build stories around helping people to overcome fear which is that internal conflict. Yeah, great stuff. Good stuff. David give out your website and tell people where they can find out more about you and your books and, of course, the books are on Amazon with great reviews. Please do newsjacking in an Audible, audio book format, I would love to listen to that driving around. It’s a good idea, I should do that and I should read it myself. Yeah, I’ve read a couple of my books since always an interest challenge to go into the studio [cuts out] book and make it sound interesting. On Twitter I’m @dmscott, my main website is my name davidmeermanscott and if you want to get exposure to some of my idea for free I have a slideshare called the The New Rules of Selling, so if you just go to Google and type in The New Rules of Selling it should pop up, I put it out a couple of months ago and it’s up too about a hundred and sixty-five thousand views as I speak now. Well, you’re obviously good at this PR and marketing stuff, a hundred and sixty-five thousand views ain’t bad for a slideshare, that’s not bad at all, good for you. Well, good, yeah, David Meerman Scott thank you so much for joining and back on the show, it’s always great to hear from you and get your latest and greatest and don’t forget listeners we started off talking about the space program and the Marketing the Moon and check that out by David that’s fascinating too. So, David, thank you so for joining us. Thanks, Jason. I really appreciate it.